We took a trip this month to Burlington, WI and environs, a little over an hour’s drive from Chicago. 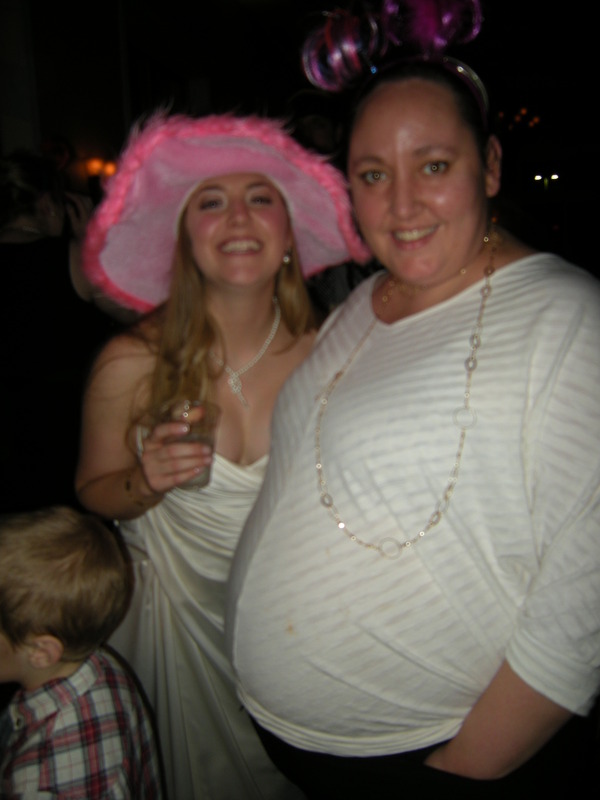 Our reason for going was to attend a niece’s wedding, a niece who has always been very dear to me. 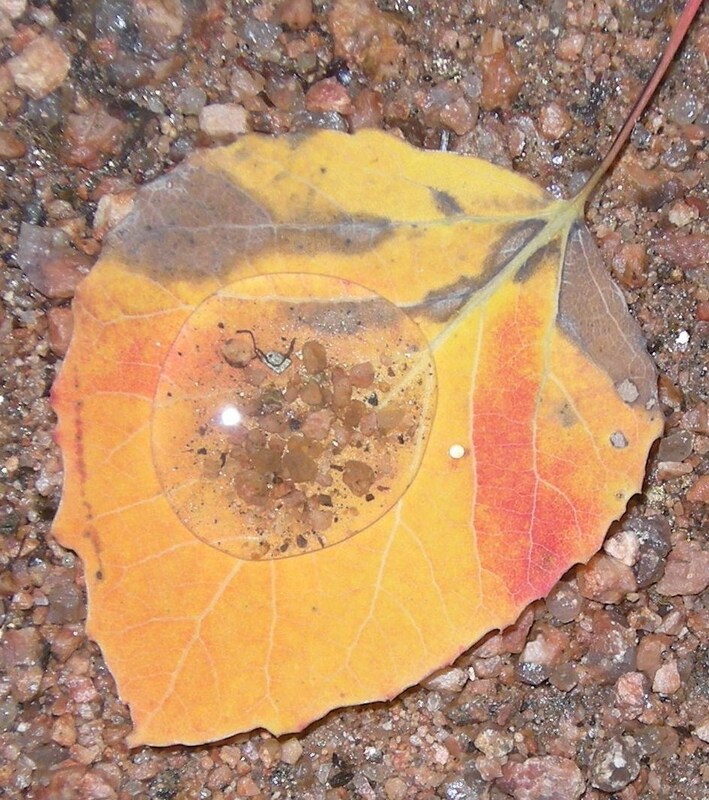 Fortunately the weather cooperated – in the low 30s, although the wind chill made it seem colder. The bride and groom had planned to have a church wedding, but that fell through because the church overbooked for the date of Jan. 11. They were planning to have the reception at the Veterans Terrace, so they changed the ceremony to be held there also, but in a much smaller room! I know it pained my niece, Julia, to have to inform everyone by email that due to the change to a smaller space, only immediate family, bridal party’s family and the couple’s aunts and uncles would be able to attend the ceremony. Julia has many cousins that she was sure would be disappointed, but it couldn’t be helped. Our son was disappointed at first, but it meant that he and his girlfriend had more time to drive there, check into their hotel room and get ready. Julia walks down the aisle on the arm of her father. 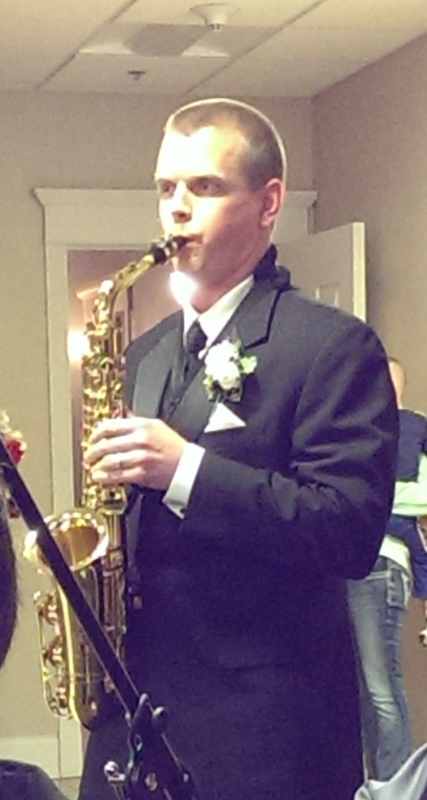 Tom plays Amazing Grace on the sax. edding. 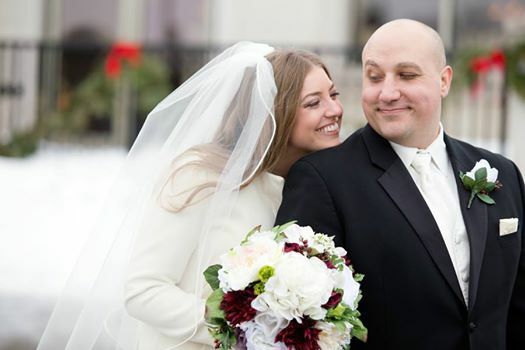 Bittersweet memories of my sister’s friends rallying to the support of Julia, her brother Tom, and their widowed father, all of whom encouraged Tom and his fiancee to go ahead with the wedding – it was what his mom would have wanted. 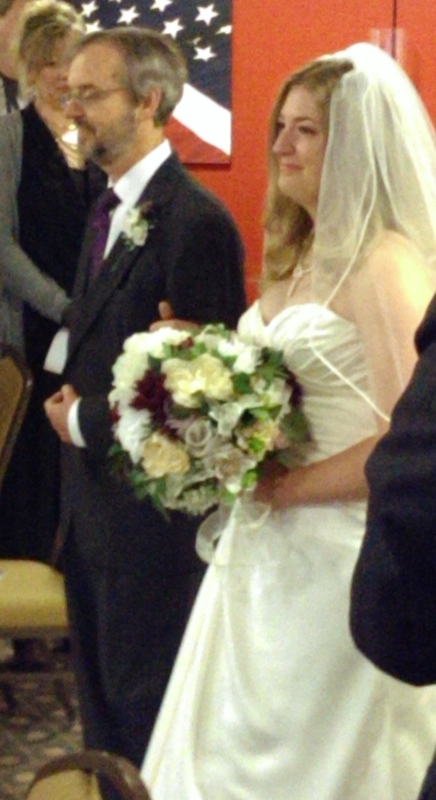 Then Tom’s wedding – full of emotional and tearful speeches and toasts, yet happy and beautiful at the same time. It was held outside on a beautiful July day and the bride looked beautiful – her hair and the bridesmaids’ had been done by a creative friend of my sister’s. 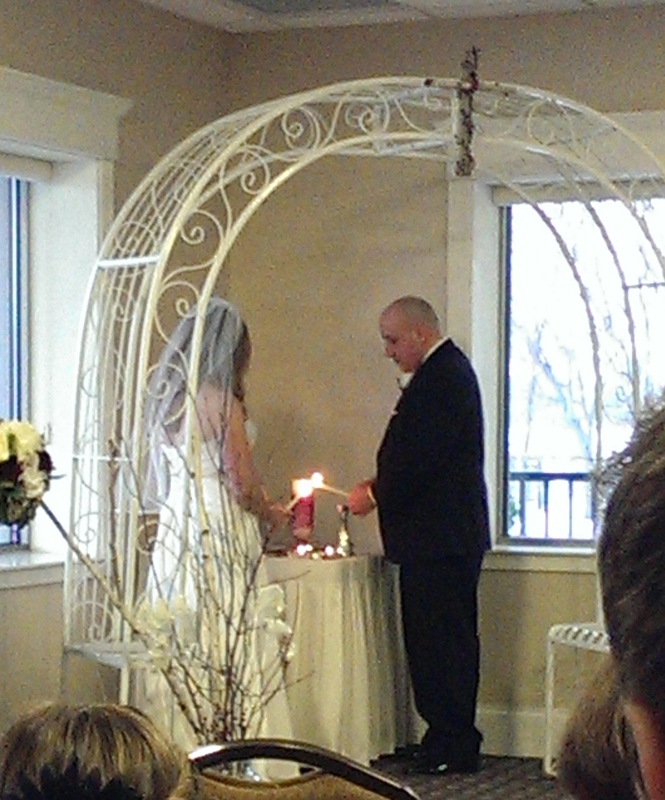 And now it was Julia’s wedding day. I don’t usually cry at weddings, but I couldn’t help crying at this one. And when Julia and I embraced later, we both had tears in our eyes, encompassing our entire history of love, joy and sadness together. All of my sister’s friends greeted me and we felt a sort of kinship as well as some of Julia’s close friends who have known her for many years. I thanked them for their support of dear Julia through the years. At the reception, all of our family as well as the groom’ s family, and their friends, came together for a nice evening of eating, dancing and celebrating. There was a photo booth set up off to one side – the kind where you sit inside and it snaps a series of 4 or 5 pictures, which are instantly available when you leave the booth. This one was operated by a friend, and there was a table of “props” – silly hats, wigs, and headbands – for people to put on for the photos if they wanted to. One copy of the strip of photos was then put into a photo album which doubled as a guest book, and the people in the photo were encouraged to write a message for the newlywed couple. 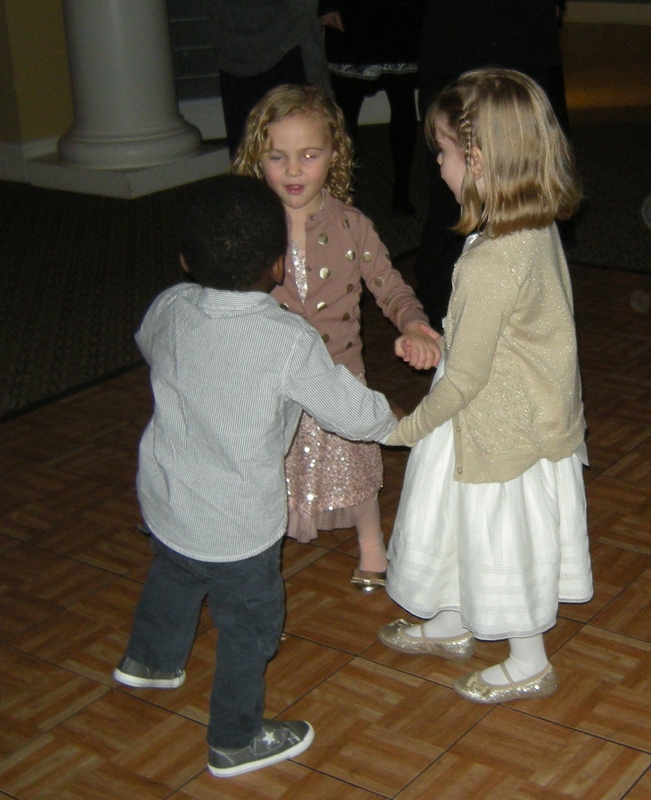 My four-year-old grand niece, Grace, gregarious as she can be once she warms up to the situation, was soon on the dance floor, playing and dancing with Isabel, her 3rd cousin of the same age, and other children of similar size tha t Grace and Isabel invited into their circle. One of these was another niece’s son, Ben, who is just about the same age younger than Grace as my son was in relation to Julia. Grace and Ben always look forward to seeing each other and play so well together – it reminds me so much of Julia and Jayme when they were that age. So much so that often I will call Grace “Julia” by mistake! Two sisters, first cousins of mine, were there too. One of these is the grandmother of Isabel and her older siblings. The other spends half the year in Canada, where she and her husband have a Christmas tree growing business, and the other half in Arizona, so I rarely see her. What a treat to have so many loved ones together! Later when we asked Jayme’s girlfriend what she thought of our family, her response was beautiful and astute: “It was amazing – you have such a big family and yet they all support each other.” How true! The next morning there was a catered breakfast by my brother-in-law (Julia’s father) and his partner, which caused a swell of family members and friends to crowd into the small breakfast room of the Baymont Hotel! We finally managed to say our good-byes as the gathering was breaking up and be on our way by 11:00 am. My husband’s family decades ago owned a small place on a nearby creek, which they called simply “The Creek”, a place they’d go on vacation. We drove around the countryside south of Burlington, looking for the exact spot so he could show me and his daughter where it was. We’ve done this before, but neither time have we found exactly where it was! Although the house has long since been torn down, my husband remembers it with nostalgia, and recognizes with fondness many nearby “landmarks” in what remain of the small towns in the area. 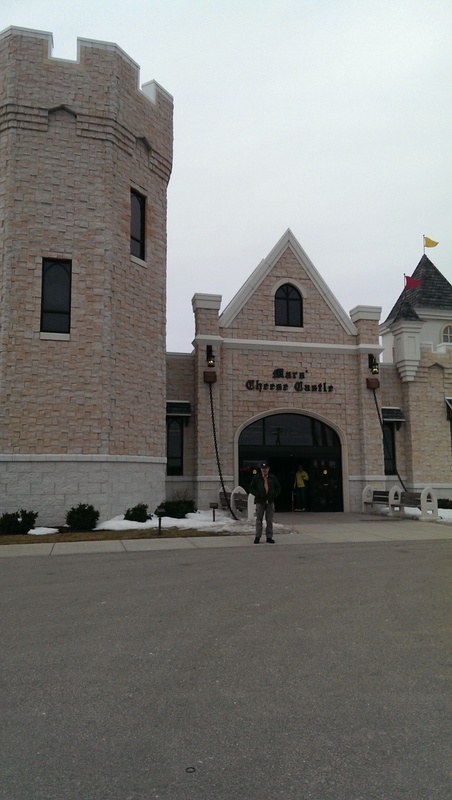 We wound our way back toward the highway via a circuitous route, finally arriving at the place we wanted to stop on the way home – Mars Cheese Castle! My stepdaughter wanted to take a picture from the front, showing the drawbridge! 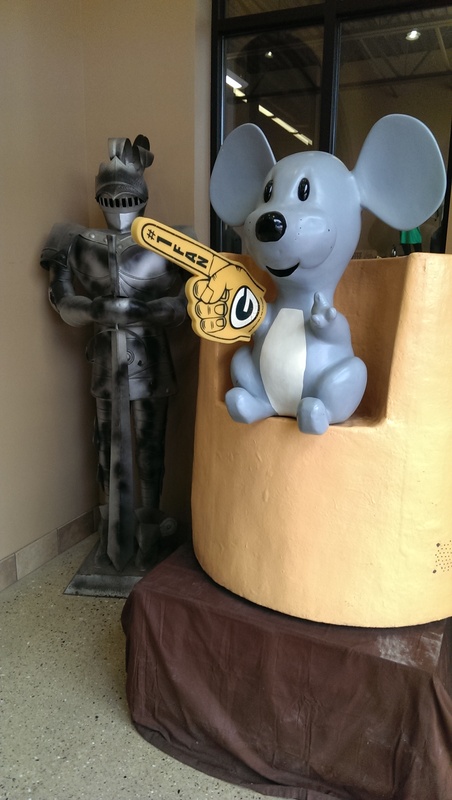 There is a giant mouse at the entrance, who wears a “fan mitt” for the Green Bay Packers. I cheered, my Illinois-born husband and stepdaughter booed! I’ve seen this place many times as I’ve traveled to and from Milwaukee and Chicago, but I had never been inside. I was amazed at how big it is! Every kind of cheese imaginable is sold there as well as a variety of other food products and souvenirs, including a favorite of Packer fans – cheesehead hats! We bought our favorites – cheese curds and mini sausages (except these were bison and venison, much leaner than beef – no guilt! ), and blocks of other cheeses to stock in our basement refrigerator until we can get back to our favorite cheese place in central Wisconsin next summer. 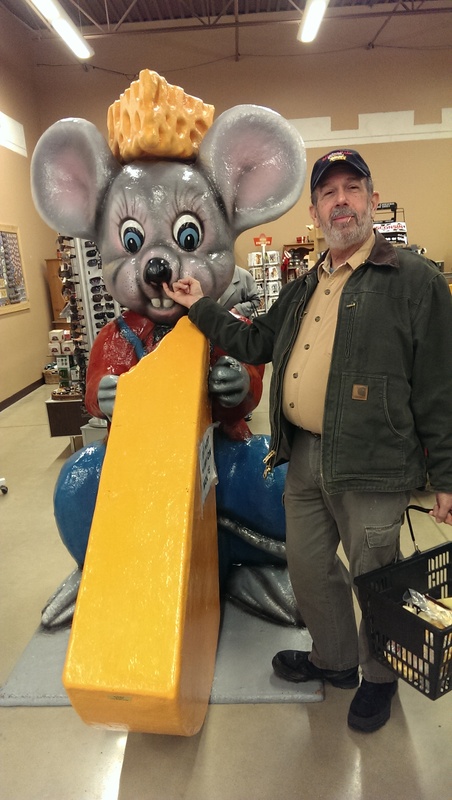 I don’t like to buy cheese in Illinois – too expensive! Many of you reading this may not know about cheesehead hats or their history. It’s a football rivalry thing: Chicago Bears fans began calling Green Bay Packer fans “cheeseheads”, meant as a disparaging term. However, the best way to deal with a so-called insulting name is to turn it around and “own” it, which is exactly what Packer fans did! They adopted this as a nickname to be proud of and soon a new industry was born: the manufacture of rubber-latex Swiss cheese wedges, which have the bottom carved out to fit on one’s head! They started making them also in children’s sizes and eventually even for dogs and Beanie Babies! Turn on an American football game in which the Packers are playing and you will see many fans wearing them. I used to have one, and wore it to costume parties or Super Bowl parties, but it got “moldy” so I had to throw it away. After we got home, a few hours later Jayme arrived with his girlfriend. Guess where they had stopped on the way home? Mars Cheese Castle! My January trip was an eventful and fun weekend to remember!